...Unusually cold, wet, and windy - wretched weather for June on the fells of Cumbria. 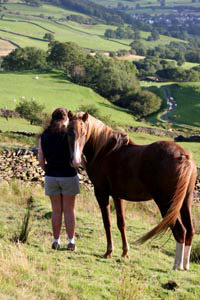 A mountain rescue group was camping at High House, and Dom had brought the mares and foals into the barn for the people to see and visit with. He had just turned the horses back out, when from a nearby field, the pregnant mare Dominita came up from across the way to say hi to Dom. He said hi, and as she turned away to walk off, he got a glimpse of her tail, and something else - an amniotic sac. 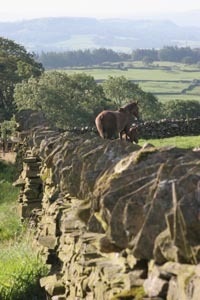 The mare wasn't due to foal for 3 more weeks. On shaky legs, Dom followed the mare to the very bottom of the field where he found a ghastly sight - a foal, who had just been born further up-slope, had rolled or fallen down the hill, and landed in the freezing cold water of a marsh in this frigid weather. In the dark and the storm, Dom managed to drag the foal out of the water, "but the foal was all wrong, dreadful..."
Allah created the desert Arabian horse from the South Wind, "Men shall follow you wherever you go...Thou shalt fly without wings." The Prophet Mohammed was wounded in battle. As he rode his treasured pregnant Arabian mare to safety, he dripped blood from his wound over his horse's shoulder as she bravely carried him away. When they reached his tribe, the blood on the mare's shoulder could not be washed off. When she foaled, the foal was marked with the same 'bloody shoulder.' 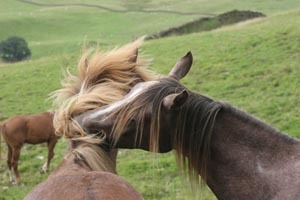 Horses that thereafter carried this 'bloody shoulder' mark were prized and said to be blessed. 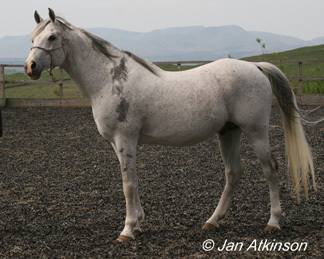 The gray mare Blue Bandaila (Cally), started it all in 1989 for Jan Atkinson. Cally was the first horse she'd ever bought - stumbling upon her when she went to the wrong farm to look at a horse for sale. Cally coincidentally happened to be over 75% Crabbet, though that was not a factor in Jan's choice at the time. Cally was a 3 year old at the time, and after Jan started riding her, they covered the fells and valleys around home, and they soon found the sport of endurance. 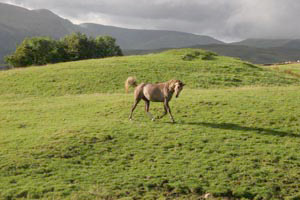 The gentle mare was a dream horse, "fiercely competitive, tremendously brave and surefooted when on rough ground or the high fells of the Lake District. She changed my life." The story of the English Crabbet Park Stud and the lines of pure-blooded desert Arabian horses produced there since 1878, has all the ingredients of an epic soap opera. It is a tale of ambition, riches, success, blue-blooded horses, mismanagement, survival of the fittest, scandal (for the humans) and tragedy (for some of the horses). Wilfred Scawen Blunt and Lady Anne Blunt decided to import to England and start breeding Arabian horses after their travels around the Middle East, where they encountered some of the world's finest Arabian horses. 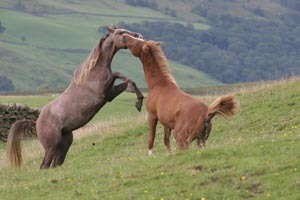 Their Crabbet Park estate in Sussex, England, was the birthplace of their line of Crabbet Arabians. 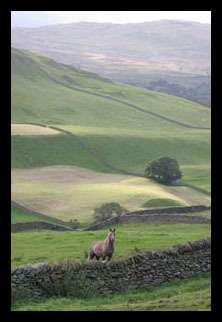 Their stud farms - Crabbet Park in England and Sheykh Obeyd in Egypt - produced exceptional horses throughout the decades - though some of the horses suffered (and died) from neglect, mismanagement, and ignorance - and eventually human scandal and self importance interfered with and undermined the horse breeding program. Mistresses, "tyranny and spirit of discord", temper tantrums, and apparent drug abuse led to a physical separation between Wilfred and Lady Anne, and a split of the Stud farm and horses. 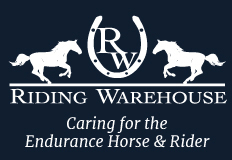 What followed was more discord, lawsuits, feuding, shot horses, neglected horses, injunctions, and, eventually, gradual recovery and rebuilding of the horse program as the Stud passed on to the Blunts' daughter, Lady (Baroness) Wentworth. The views, and the light from on top of the hill at Upper High House, are staggering. Every five minutes the light changes and alters the landscape and the views so that it constantly looks different. Add a few storm clouds, or a couple of horses galloping along the hill, and it could be a fantasy world. 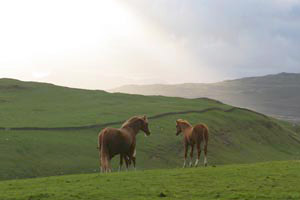 Seren Arabians sits just inside the Lake District National Park, in Cumbria in northwest England. It's the largest national park in England, and includes England's highest mountain - Scafell Pike, and its deepest lake - Wastwater. You can see Scafell Pike from Upper High House. 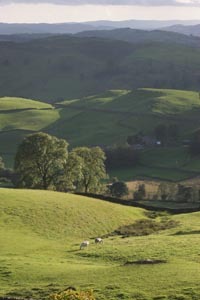 The National Park has 3500 kilometers of rights of way and 12 of the largest lakes in England, for boating, hiking, climbing, and riding, along lakeshore wetlands, upland heaths, coastal dunes and arctic-alpine screes. Jan and Dom can take off on any number of trails and ride on 30 or 40 or 50 mile loops. Here, a day spent outside sitting and watching the fantastic light and beautiful horses sculpt ever-changing pictures in the landscape, is a day well spent. 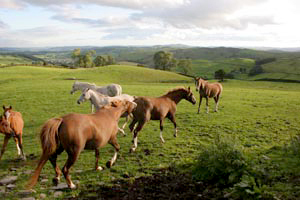 I've landed at Seren Arabians ("Seren" means "Star" in Welsh) in the Lake District of Cumbria, England - home of Jan and Dom Atkinson and Crabbet Arabian horses. They are carrying on very selective bloodlines from the original Crabbet stud (established in the 1870's) that ultimately dispersed in 1973. Endurance riding friends Chris and Kara Yost of southern Idaho stumbled on Seren Arabians last year when visiting England. Ultimately they brought a Seren Crabbet stud colt home - one of the lucky few people to do so! 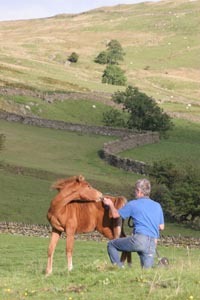 Jan and Dom are very protective of their Crabbet offspring and won't sell to just anybody - you have to prove the horse will get a good home and will be used properly. 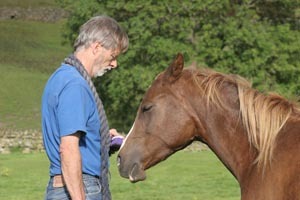 The Seren horses are lovely, sturdy, and allowed to be horses. They're known for their even temperaments and friendliness. 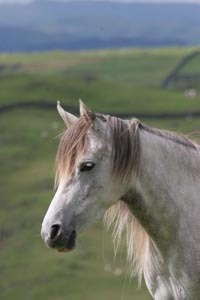 They're brought up barefoot on steep hills where they develop good muscle and bone naturally, and they live in herd situations so they mature mentally and naturally - like horses. The Atkinsons don't show (though 2 of their homebred geldings just won first and second place in the Wessex Arabian Horse Group Summer C Show, and one of their 3-year-olds just got the highest score this year, and the highest score ever for a 3-year-old and for a purebred Arabian, and the second highest score of all time, in the British Equestrian Federation Futurity Grading for endurance), and they have been too busy to do endurance lately. 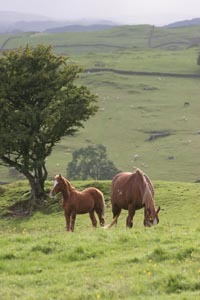 But their horses - and their 'unconventionl' method (in Great Britain, and Europe, anyway) of turning stallions out with the mares and colts in herds and bringing them up this way - are speaking for themselves.